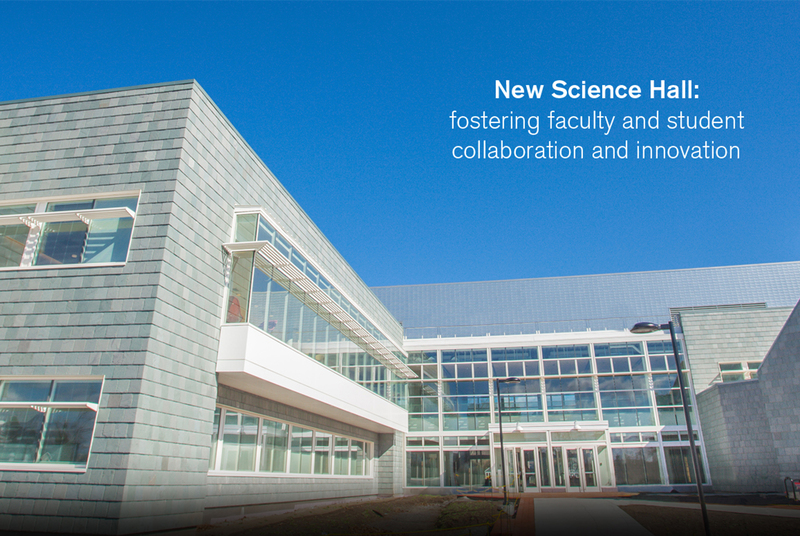 SUNY New Paltz celebrated the opening of Science Hall, a modern, two-story building designed to support the College’s burgeoning enrollments in the STEM fields, at a March 9 ribbon cutting. College students, faculty and staff were joined by New York State Senator John J. Bonacic, State Assemblymember Kevin A. Cahill ’77, project architects, contractors and SUNY Construction Fund representatives to formally open the doors to the new facility. Funding for the $48 million Science Hall project was secured with support from Senator Bonacic and Assemblymember Cahill. The first new academic building on the New Paltz campus in nearly 20 years, the 77,000-square-foot building connects the College and the Village of New Paltz as a gateway to campus and a recognizable first impression for visitors. Science Hall is designed with a slate exterior that pays homage to the rooftops of Historic Huguenot homes built here in the 17th and 18th centuries. The building is constructed to LEED Silver Certification standards for sustainable design and construction from the U.S. Green Building Council. The floor of the lobby is inlaid with fossils from archeological sites in Wyoming’s Green River Formation, which date back a bit further than the Huguenots: about 50 million years. The successful design and construction of Science Hall was made possible thanks to the contributions of project architect Zimmer Gunsul Frasca Architects, of Portland, Ore., general contractor Niram Construction of Boonton, N.J., and numerous other subcontractors and partners. The project generated about 300 jobs, including more than 200 direct construction jobs and many additional jobs through materials and equipment suppliers. Science Hall is home to offices for the Dean of Science & Engineering, Computer Science, Geology, Physics and Astronomy, Geography, and the AC2 program, which supports students from underrepresented backgrounds pursuing degrees in STEM disciplines at New Paltz.